@john-cox Same templating as storm. Seems consistent to me. @john-cox because that way it doesn't have any effect on the first spell played, spells don't count themselves. I meant for the land tap mana cost; "Prior" would make more sense. I could see confusion where the first point of mana would be the normal type and amount, then mana 2+ (other) is just (C). This card looks like it has real promise to me - kinda feels similarly tailored towards our format the way that Grafdigger's Cage was (only this obvs vs shops & storm strats). If a land taps to produce 1+X amount of mana (of any color or colorless), it produces C instead. @john-cox They used the same template as Contamination so it is consistent with the previous iterations of this affect. Confirmed as an uncommon. NULL ROD FLAVOR CALLBACK!!!!! @hierarchnoble This is so great. There is no storm near the sphere. I love this card so much. This is the most potent hate card we've seen since Grafdiggers' Cage! I don't know that it stops Shops in Vintage exactly, since mana rocks can pretty much cover the spread after turn 2, but it seems absolutely brutal, BRUTAL in Legacy. I suspect this is going to rock the sideboards forever now. Holy crap you're right: the art direction was "Anti-storm tech"
I’m looking forward to playing with this card. Glad it’s an uncommon too. Is it strange to other people that this is uncommon? Also, does anyone else feel like they based the sets value in the hrad with anrock because of ut? @maximumcdawg What is it brutal against in Legacy? I think it's pretty much useless there. @fsecco Stops Elves pretty well. 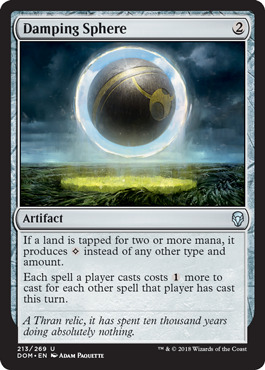 Taxes them going off like a sphere, but also locks down their main way to beat a sphere (cradle). If you can play it turn one it's strong against affinity, tide, belcher, storm, tinfins, few other lists. @protoaddct Yes, it is weird to me as well. I keep thinking, what will this be used for in limited and standard especially since it's uncommon? I don't play limited or standard so I'm not certain that it makes sense to print this card to deal with what we've seen so far. Powerstone Shard and Guilded Lotus don't seem like something that need a hate card, but I don't trust my evaluation of this. Additionally I'm completely lost as to the need for the other part of this card which seems to hate on cantip/storm decks. Powerstone Shard and Guilded Lotus are not affected by this anyway, only land. Right now there is a single land in the set it affects, and relatively small set of cards that it could affect with its second clause, unwind being the one that sticks out to me, warlords fury perhaps in limited. Besides the fact that it's a bafflingly blank card in limited, cards of this complexity level and niche use are almost always reserved for rare. This feels like one of two things, either an attempt to forcibly fix the modern and vintage metas, or an attempt to offer a chase uncommon ala divining top or Aether Vial to drive up set sales. Either way I am not in love with them doing it this way. I love this card. Thank you DCI... errrm, I mean Wizards. I saw this card in Facebook and I realized that the best use for it is probably IN workshops. Making your Shop land only tap for 1 isn't that bad of a tradeoff for increased Sphere effects. @desolutionist making shops tap for 1 and making ancient tomb tap for 1 while still dealing 2 damage to you seems pretty bad to me. Edit: The taxing effect also doesn't affect the first spell played in a turn. Just at the third spell this taxes more than thorn/sphere, I'm not sure that this is worth crippling your own mananase for. On the other hand, this not affecting the first spell might just be the reason that crippling your mananase is slightly tolerable...I'm not sure, but in shops this mostly seems like self hate to me.